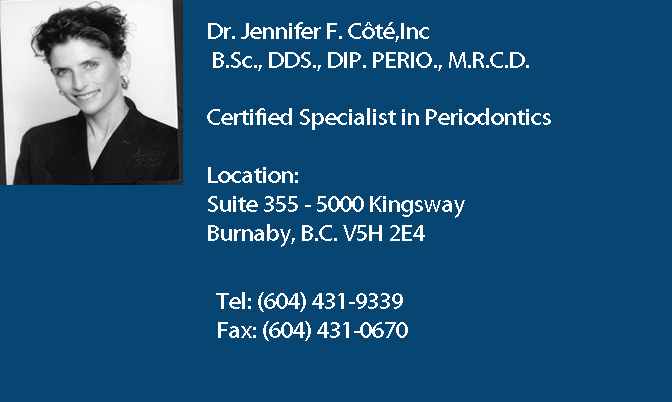 Dr. Cote is a specialist in Periodontics and Implantology. The practice specializes in treatment of gum disease, including cosmetic procedures to esthetically enhance your smile, as well as dental implants that can replace single or multiple missing teeth. She also diagnoses and treats oral pathology. Cosmetic periodontal procedures are a predictable way to cover unsightly, sensitive or exposed root surfaces and to prevent future gum recession. If you are unhappy with the appearance of short teeth this can be greatly improved by a combination of periodontal procedures along with cosmetic dentistry. Although your teeth appear short, they may actually be the proper length. The teeth may be covered with too much gum tissue. We can correct this by performing a periodontal plastic surgery procedure, called crown lengthening. During this procedure, excess gum and bone tissue is reshaped to expose more of the natural tooth. This can be done to more than one tooth, to balance your gum line, and create a beautiful smile. Another cosmetic procedure is the soft tissue graft. It is used to cover exposed unattractive tooth roots, reduce gum recession and protect the roots from decay, sensitivity and eventual tooth loss. Tooth loss causes bone to resorb and can lead to an unnatural looking indentation in your gums and jaw, an appearance of general aging. The original look of your mouth may change because of spaces under and between replacement bridges and teeth. Bone grafting following tooth loss can preserve the socket/ridge and minimize gum and bone collapse. There is less shrinkage and a more esthetic tooth replacement for either an implant crown or fixed bridge around the replacement teeth is then possible.